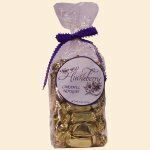 Enjoy these delicious caramels with Wild Huckleberry nougat centers. So scrumptious they melt in your mouth. Ingredients: Corn syrup, sugar, palm kernel oil, sweetened condensed whole milk (whole milk, sugar), reduced mineral whey, mono & diglycerides, red cabbage color, soya lecithin, salt, artificial & natural flavors.